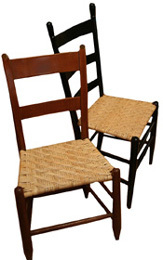 “Blind Chair Caning” can refer to two different things. Blind chair caning on a half-drilled wood frame will test your mettle. Facing this demanding situation in a spirited and resilient way is definitely not for all chair caners. Blind chair caning means that every strand has to be measured, custom cut for the chair, and threaded through the pattern where it is then glued into its hole. Imagine the time involved! …but this is not the main focus of today’s blog. Bonnie Krist in Ohio (who, by the way, rode the same school bus with me as a child in Massachusetts!!! Crazy, huh? We both grew up on rural farms.) shared this with The Seatweavers Guild. But back to the share post. In the early 20th century, it was very common for chair caning to be taught at schools for the blind. Caned chairs were common, chair caners were much in demand, and people frequently brought their chairs to schools for the blind for recaning. 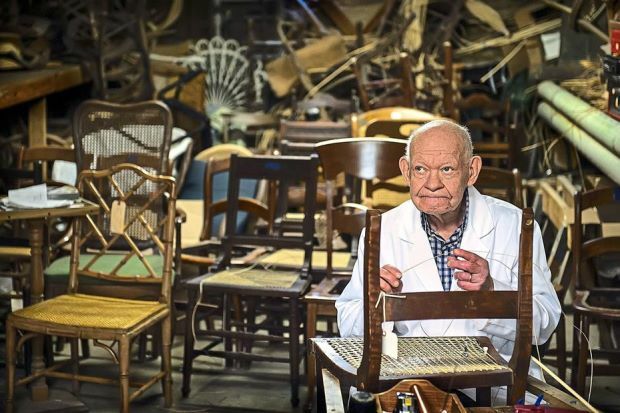 Today’s feature in People magazine on a 90-year-old chair caner is pretty inspiring. It reminds us that no matter how challenging we might find dealing with caning a certain feisty chair, we can SEE the chair! Imagine if we were truly Blind Caning. It’s about Revelle Lee, a Master Caner in Missouri who happens to be blind, and has been doing it for nearly 80 years! I’ll let you read this inspiring story for yourself. Thanks also to People Magazine and the Kansas City Star for realizing the significance of this living, breathing Treasure. BTW, the Kansas City Star is the newspaper that printed quilt patterns in their newspaper for 30 years. They appreciate the value of traditional crafts.